You can fly to Laos, but an overland crossing is much more romantic. There's a real frisson of excitement that comes with entering an actual "People's Democratic Republic." The border becomes a "frontier." Customs inspectors turn into "communist officials." Even a tourist visa can, with a dash of imagination and a cheesy bad-guy-in-a-James-Bond-movie tone-of-voice, qualify as "your papers." It's very dramatic. Anything can happen. In truth, not much does. Young men in ill-fitting green uniforms and oversized shoulder boards inspect my passport. There's a lot of rubber stamping and form filling and a rather dubious 20 baht administrative charge that most people reckon goes straight into somebody's pocket. It all takes about 25 minutes, just long enough to meet David and Sarah, a nice couple from England who suggest we share a tuk tuk into Vientiane and a round of cold beers once we get there. Vientiane reminds me of those bombs that are said to remove all the people without harming the buildings. It's a sprawling, under-populated place chopped up by grandiose, but near-empty, boulevards. There's not a great deal to see here, but it's an agreeable spot to chill out for a day or two before heading inland. I cash a $100 traveller's cheque, get back a thick wad of Lao money, amuse myself with a bad Mae West impression — "is that 954,000 kip in your pocket, or are you just happy to see me?" — and set out in search of liquid refreshment. At the Delight House of Fruit Shakes (laundry service also available), I pay just 50 cents for a huge glass of freshly squeezed pure mango juice. Halfway through, I meet another nice English couple, Dave and Katie, and we switch from juice to Beer Lao. Beer Lao is the national brew of Laos. It's the only beer you can buy. It's delicious. Dave tells me that a major European brewery recently bought a half-share in Beer Lao. The brewery sent out a team of experts to show the Laos how to brew beer properly. 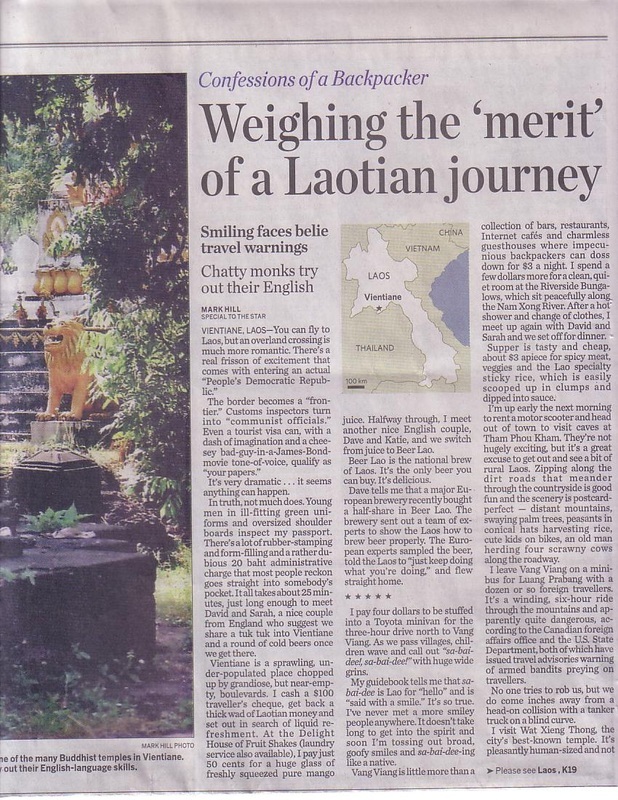 The European experts sampled the beer, told the Laos to "just keep doing what you're doing," and flew straight home. 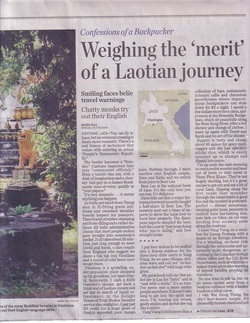 I'll hear this story over and over again from all sorts of people as I make my way through Laos. Sometimes the European brewery is Heineken, sometimes Carlsberg. It's a nice tale, but it's not true. Neither Heineken nor Carlsberg have any association at all with Beer Lao. I pay four dollars to be stuffed into a Toyota minivan for the three hour drive north to Vang Viang. As we pass villages, children wave and call out "sa-bai-dee!, sa-bai-dee!" with huge wide grins. My guidebook tells me that sa-bai-dee is Lao for "hello" and is "said with a smile." It's so true. I've never met a more smiley people anywhere. It doesn't take long to get into the Lao spirit and soon I'm tossing out broad goofy smiles and sa-bai-dee-ing like a native. Vang Viang is little more than a collection of bars, restaurants, internet cafes and charmless guesthouses where impecunious backpackers can doss down for three bucks a night. I spend a few dollars more for a clean, quiet room at the Riverside Bungalows which sit peacefully along the Nam Xong River. After a hot shower and change of clothes, I meet up again with David and Sarah and we set off for dinner. Supper is tasty and cheap, about three dollars apiece for spicy meat, veggies and the Lao speciality sticky rice, which is easily scooped up in clumps and dipped into sauce. Service is very Lao — drink orders get confused, the number of menus provided bears no relation to the number of people at the table, waiters carry plates like it's the first time they've ever done it. It's rather like a bunch of five-year-olds with a tea set playing restaurant. It should be irritating and anywhere else it would be, but here in laid-back Laos it's charmingly endearing and we love it to death. I'm up early the next morning to rent a motor scooter and head out of town to visit caves at Tham Phou Kham. They're not hugely exciting, but it's a great excuse to get out and see a bit of rural Laos. Zipping along the dirt roads that meander through the countryside is good fun and the scenery is postcard perfect — distant mountains, swaying palm trees, peasants in conical hats harvesting rice, cute kids on bikes, an old man herding four scrawny cows along the roadway. I know it's culturally insensitive, but I just can't stop humming the theme from M*A*S*H.
I leave Vang Viang on a minibus for Luang Prabang with a dozen or so foreign travellers, It's a winding, six-hour ride through the mountains and apparently quite dangerous, according to the Canadian foreign office and the American State Department, both of which have issued travel advisories warning of armed bandits preying on travellers. I'm blissfully unaware of this as I only ever read travel advisories after I get home. No one tries to rob us, but we do come inches away from a head-on collision with a tanker truck on a blind curve. Every travel story and guidebook makes a big deal of the fact that UNESCO has designated Luang Prabang a World Heritage Site. I'm not entirely sure what UNESCO does or even stands for (are they the ones with the Halloween boxes? — "trick or treat for UNESCO!") and were I a real journalist, I'd find out what a World Heritage Site actually is, but what I can tell you is that Luang Prabang is a nice looking town. I visit Wat Xieng Thong, the city's best-known temple. It's pleasantly human sized and not excessively restored. Coming from Thailand where the wats are colossal and showy, it's refreshing to see a Buddhist temple that looks like it exists for prayer and contemplation rather than package tourism and wide-angle photography. I spend a few days wandering around this pretty town, dropping into some of the smaller wats. At one, a novice monk approaches with a stream of questions "What is your name? Where are you from?" etc. Novices like to practise their English and will seek out foreigners. We quickly get past the language lesson and I learn that he's 18 years old, he's been a novice since 13, he gets up at 4am to "pray Buddha" for a full hour, then heads into town to beg food from the Lao people, who feed the monks as a way to "make merit." There are about 20 foreigners on the slow boat which will take me up the Mekong River and out of Laos, plus a scattering of locals heading north and a load of cargo, including sacks of rice and five massive plastic bags filled with drinking straws. One of the girls jokes that when we arrive there'll be a hundred people lined up on the dock holding up bottles of Coke and crying out "thank goodness you're here." We all share a laugh and start getting to know each other. It's a two-day trip upriver so I'm pleased to discover that I've fallen in with a good crowd. Aside from me, Canada is represented by a quiet young fellow from Montreal. There's a recently retired pair of German aid workers, a few well-travelled Europeans, a handful of Brits, a middle-aged family man from Israel, two pretty young women from Colorado and an Aussie gal in a well-tailored pair of hiking shorts that more than makes up for the lack of an in-flight movie. The only oddball (and there's always one) is a Swiss who's spent all his money and has no cash for food, water or overnight accommodation. The scenery is spectacular and every hack travel writer cliché springs to mind (but not to paper, aren't you a lucky reader?). I burn through my film in the first hour, but in two days on the river I won't tire of the view. We stop for the night at Pakbeng and set about securing beds for the night. The oddball is spotted at various guesthouses trying to barter bars of Swiss chocolate for a room. The sweets-for-sleeps program fails miserably and eventually the quiet Canadian takes pity and offers to share. Pakbeng and its guesthouses are infested with rats. Mine isn't too bad. I can hear them scurrying about, but a hastily improvised pair of tissue paper earplugs let me sleep. Others aren't so lucky. The American girls, troubled by a procession of tomcat-sized rodents running back and forth beneath their beds, get no rest at all. Next morning, we board a different boat for the last leg of our journey. Joining us are three saffron-robed novice monks who sit together at the front of the boat. I've bought four small baguette sandwiches, which isn't a whole lot for a nine-hour trip. But I remember my conversation with the young monk in Luang Prabang and give each novice a sandwich, leaving just one scrawny baguette to last me the day. By the time we arrive at the border town of Houayxai, I'm delirious with hunger. On the other hand, I reckon I'm simply bursting with merit. Overall, I call it a fair trade. Mark Hill is an Ottawa writer.